TWO-DECK CARD TRICK (U.F. Grant): A spectator shuffles a deck and picks a card. You count to the value of this card in a second deck and find the matching card. MIRACLE REVERSE (Francis Haxton): A red card is placed in a blue deck. A blue card is placed in a red deck. These two cards reverse themselves and they are shown to be the cards removed from the opposite colored decks. PACKED BAGS (Aldo Colombini): A spectator touches a card which is reversed in the deck. You remove another deck and you reveal the same card in a spectacular way. 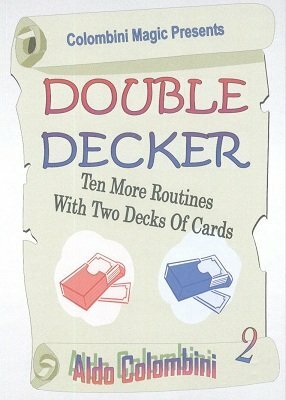 SECOND CHOICE (Gus Southwall): Three matching pairs are found, using you, a spectator and two shuffled decks. THE SAVAGE (Aldo Colombini): A series of ‘effects’ (including a poker demonstration) using two decks of cards. RESULT OF THOUGHT (Roy Scott): Cards are dealt from two decks at the same time and cards are matching according to the selection of the spectator. ALIEN ENCOUNTER (Peter Duffie): A card is selected from a blue deck. In a red-backed deck you remove the AS to attempt to locate the selection. The Ace, at the end, becomes the selection. RENDEZVOUS (Nick Trost): Two decks are shuffled, by you and the spectator. You cut your deck into three packets and the spectator does the same. The top card of each packet match. ULTRA COINCIDENCE (Martin Gardner): A double matching effect is achieved by the most economical means possible. MIND OVER MATTER (Larry West): The performer first demonstrates the ability to ’mentally’ influence a spectator to name a pre-chosen card. Then the performer magically causes the matching card to jump to the other deck and appear at a number chosen by another spectator.